M6 excels in music experience! Built-in 2.1 speaker system owns 2 tweeters on both sides and 1 woofer in the middle. 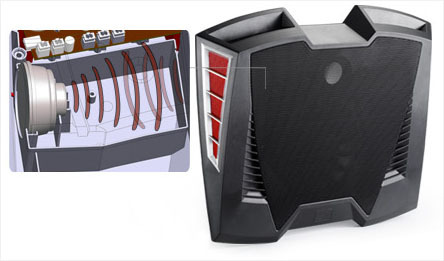 The speaker cavity inside M6 is extended to the maximum to give you the most auditory pleasure when gaming. You can easily swap between this 2.1 speaker system and your gaming headset with the 3.5mm stereo line in jack. 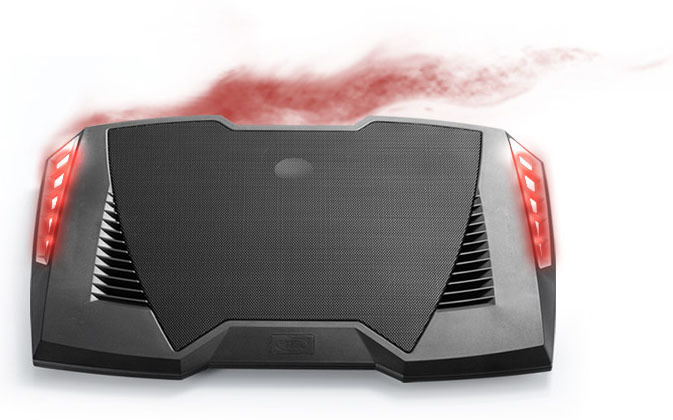 Inspired by Need for SpeedTM, the designer crafts this notebook cooler which can combine the looks of a luxurious sports car and the stunning sound effect of its engine. That’s M6! The front end is designed in triangular shape with a lean edge, just like a sports car illustrates aerodynamics to the maximum. 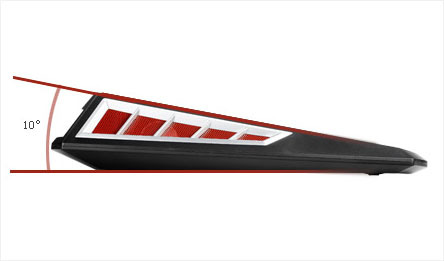 The sleek design also features the silver-red side windows and fully covered black metal mesh at the top. A gaming laptop may heat up very fast and need a good cooler to ensure its operation. With a built-in 14cm fan, M6 can cool down your gaming laptop and you can indulge yourself as long as you wish. If you want to rest after playing, you can turn down the fan speed with the control knob. Gaming needs cooling! 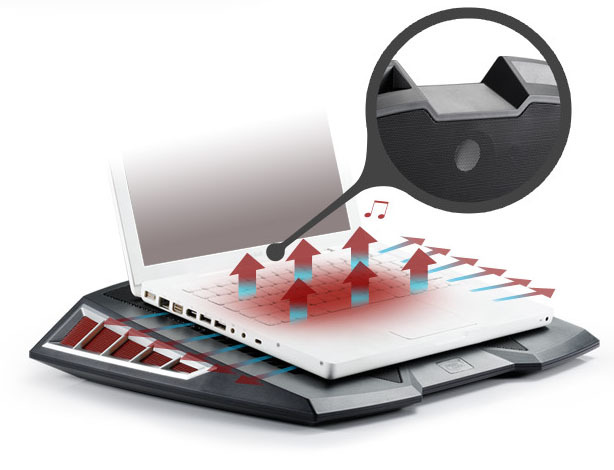 With a big 14cm fan running at 700 to 1100rpm, M6 provides with excellent cooling performance for your notebook. 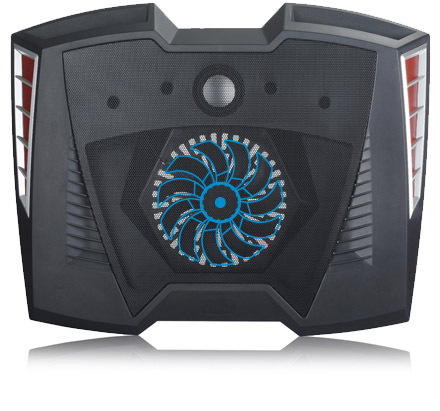 And the fan speed can be adjusted by the knob on the side of the cooler for a balance between performance and noise. 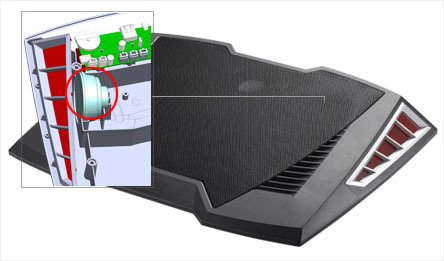 Inner Magnetic SpeakersThe inner-magnetic speakers can ensure the stability of the sound and avoid any interference with notebook components. Damping Cavity for SpeakersM6 has large damping cavities for the high pitch from the tweeters. These cavities ensures superb music with no resonance effect. 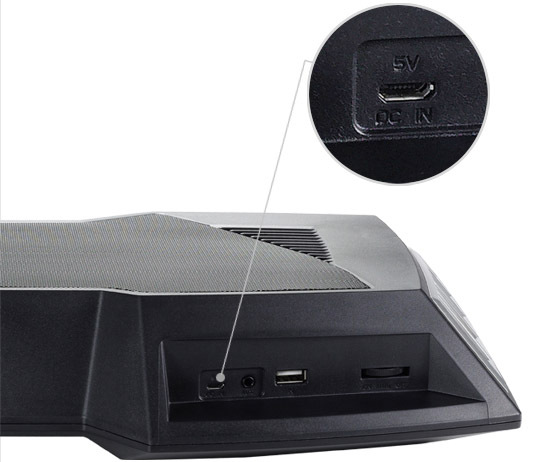 Ergonomic Viewing AngleM6 has an ergonomic viewing angle at 10°, which is designed for your health care by easing the spine strain during long time gaming. USB HUB for Additional USB DevicesM6 is equipped with 1 USB 2.0 input port and 4 output ports for your additional USB devices, such as Mouse, HDD, etc.